As per our email conversation I ran wwClient_Console.exe from Visual FoxPro as you suggested, but that does not resolve the issue as shown here. 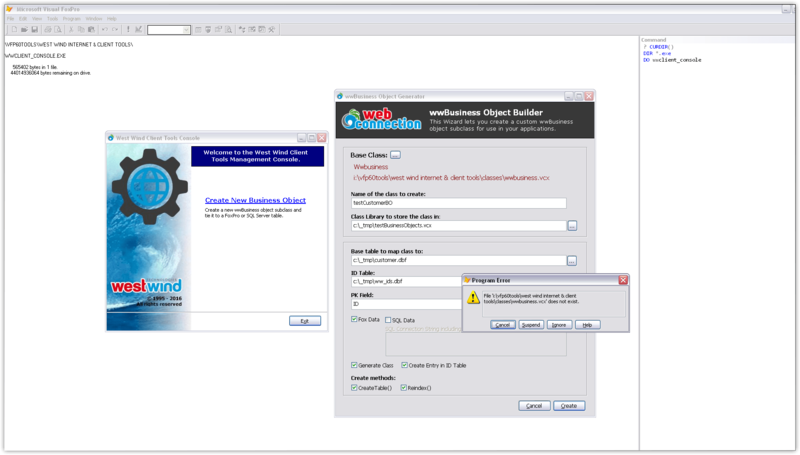 wwBusiness.VCX is not part of the current download from your site so that reference throws an exception when it's referenced by the wwBusiness BO Builder. To try to troubleshoot this I tried to build the included wwhttpdemo project, but that generated tons of missing references, showing here. Finally, it's possible some of the "read me" and other links included in the download package would shed light on the above, but unfortunately they all yield 404s, as shown below. Appreciate any thoughts you have on the above as I'd like to complete my analysis in the next few days and determine if I'll be using West Wind Internet & Client Tools as part of my application's toolset. Not sure why you would get an error the file is missing. Are you sure the vcx lives in that location? Wonder if it might have to do with the long path name? I have to check... Could be a shareware version which doesn't ship source files, but the wwbusiness.vcx is actually shipped as a special case in the classes folder. FWIW, in the next update there will be a change to the business object class to PRG classes. The old ones will still be there, but the new class will be more portable and source control friendly. The bus builder in general in the client tools tends to run behind in functionality vs. Web Connection and there are a few updates pending for the next release. As to compiling the sample - that will only work with the registered version not the shareware version since it doesn't have access to the source files that the project is built against, so that makes perfect sense. The relative links still work. Those have already been fixed pending the new release (hopefully early next week). Rick, as he said, if you download the sample Client Tools zip file from the web page, the VCX classes and other PRGs are not present in the zip. I tried this myself, and sure enough, the zip is missing some required files. Ok so I took a look at the actual download file and yup - it's missing the classes folder that contains the business object base class. I've re-uploaded an updated version that has that in it. 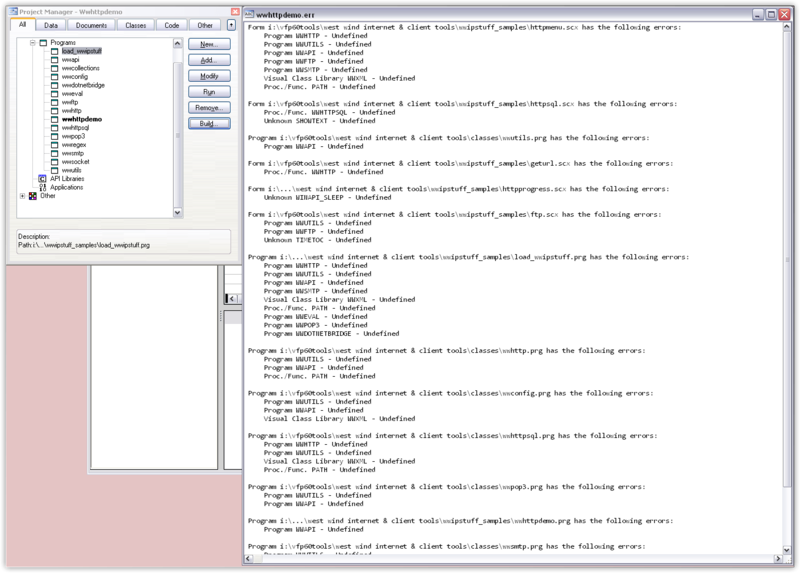 The class has to exist for the Wizard to work and subclass from, but it's not required to run as the classes are embedded in wwClient.app. Registered version comes with source code, so they always have access to the source files to subclass from. Anyway, grab the updated download and see if that gets you going. Thanks Rick (and Matt)... My window has closed on this for now but I'll endeavor to circle back later next week and give it a try. Alex - I know the data access and Business Object setup part of Client Tools fairly well, so I'll be glad to help as much as you need to get up and running with this. Can even give you my direct email and phone number if you wish to expedite conversations. I'm curious - Would you be using this with DBF data tables or Sql Server?